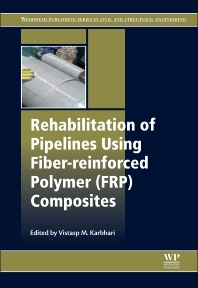 Rehabilitation of Pipelines Using Fibre-reinforced Polymer (FRP) Composites presents information on this critical component of industrial and civil infrastructures, also exploring the particular challenges that exist in the monitor and repair of pipeline systems. This book reviews key issues and techniques in this important area, including general issues such as the range of techniques using FRP composites and how they compare with the use of steel sleeves. In addition, the book discusses particular techniques, such as sleeve repair, patching, and overwrap systems.